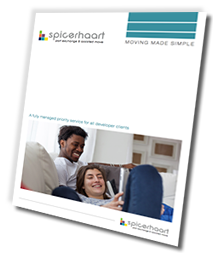 Spicerhaart's Part Exchange & Assisted Move services are the key to unlocking your true sales potential. Spicerhaart will complement your existing scheme by helping both to value any existing property before acquisition and manage the sale through to completion. For developers and house builders with their own, in-house part exchange scheme we can provide: appraisals, comparable prices with other properties for sale, plus further relevant information. We will provide this information within a short space of time, giving you the confidence to buy your customer’s existing property at the right price. This means you can proceed with sale of your new build homes as quickly as possible. Not least, they benefit from no estate agency fees and can remain in their property until plot completion. We will provide a simple and effective process to increase conversions. As our client, we will provide you with all the information you require in the format you need it. We will provide this within a short space of time, giving you the confidence to buy in at the right price. Funded part exchange is an innovative solution for house builders and developers who do not run their own part exchange scheme. Even if you do run your own in-house scheme, our funded solution can be ideal for customers who do not fit the criteria that you need. 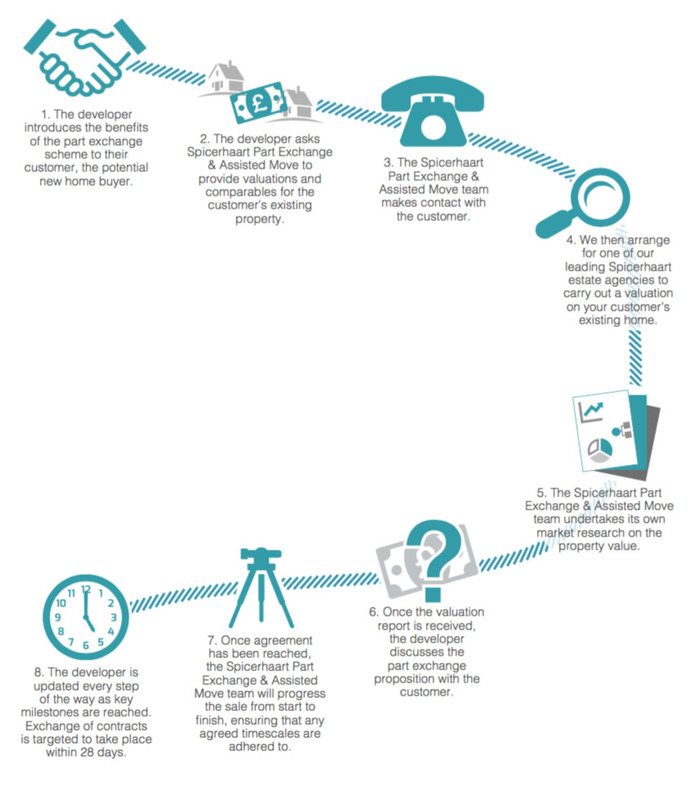 Under the funded part exchange scheme, Spicerhaart Part Exchange & Assisted Move provides buyers to purchase your customer’s existing property. Contracts on the purchase are usually exchanged within 28 days, leaving the customer free to buy one of your new homes. Unlike other part exchange companies, at Spicerhaart we work with a number of specialist, cash rich buyers, ensuring that we are always in a position to facilitate the purchase of any property, at any value, anywhere in the country. Even properties with structural or other problems can be considered. The ability to capture a much wider piece of the market appealing to those potential buyers with a property to sell. Using our funded part exchange scheme also leaves you with the ability to provide further incentives to the borrower should you wish to do so. We pride ourselves on the speed with which we handle the process for you and your customer from initial enquiry through to completion of the sale. Our objective is to structure part exchange deals that work for you. We will work closely with you to ensure a seamless sales process, keeping you updated every step of the way. We can work directly with your customer or can operate through you, whichever you prefer. We will undertake our own market research and commission appraisals of your customer’s property by two local estate agents. We will then provide you with a detailed summary pack and an opinion on property value. Once you have received the valuation report for their existing property we will seek offers from specialist cash buyers and, if the offers are acceptable, we will work with you to ensure a seamless transaction.